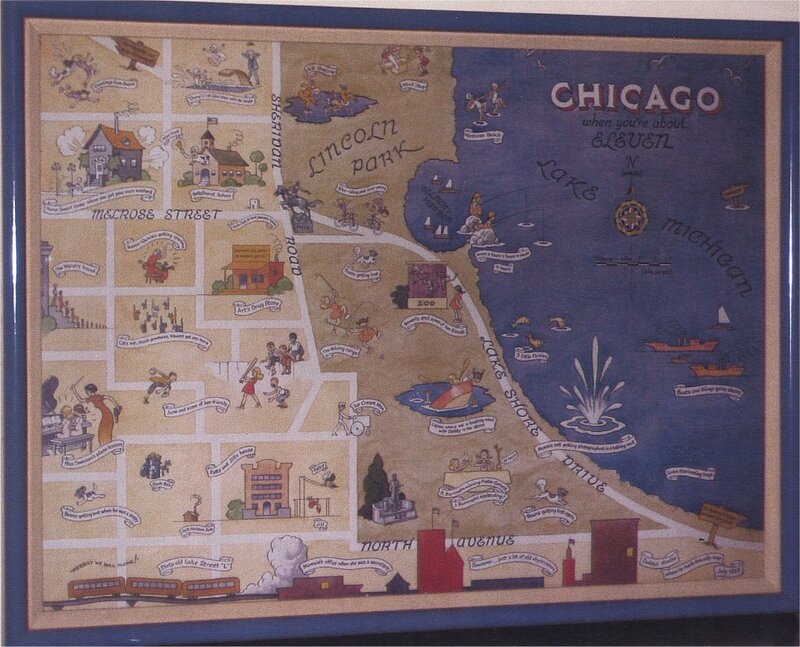 "Chicago When You're About Eleven"
in their childhood with a little explanation between each picture.
" 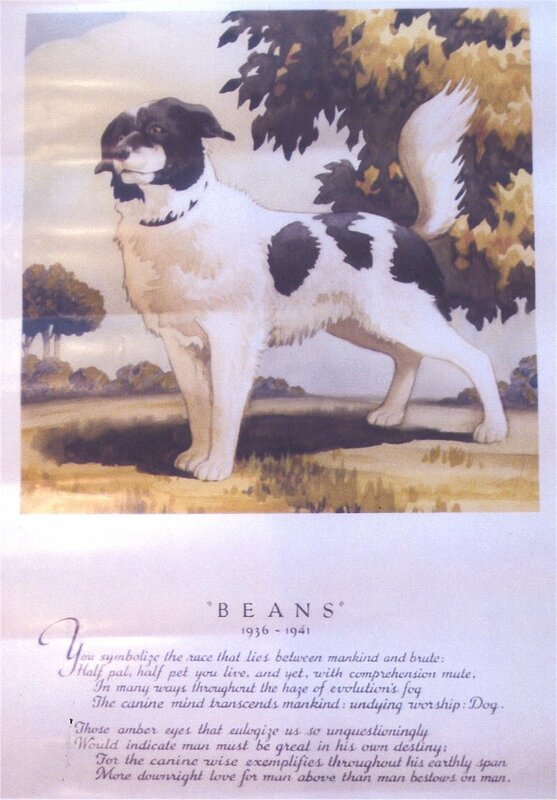 B E A N S "
You symbolize the race that lies between mankind and brute. Half pal, half pet you live, and yet, with comprehensions mute. The canine mind transcends mankind: undying worship: Dog. More downright love for man above than man bestows on man. STUDLEY BURROUGHS Studley Burroughs of 465 Anthony St. died at DuPage Memorial hospital in Elmhurst last Friday morning. He had not been well for a year, and on the preceding Monday had had a surgical operation. He was born in Chicago on Dec. 26, 1892. His funeral took place the day after his fifty-seventh birthday. In 1936 he married Miss Marie English, and five years later the couple came to live in Glen Ellyn. 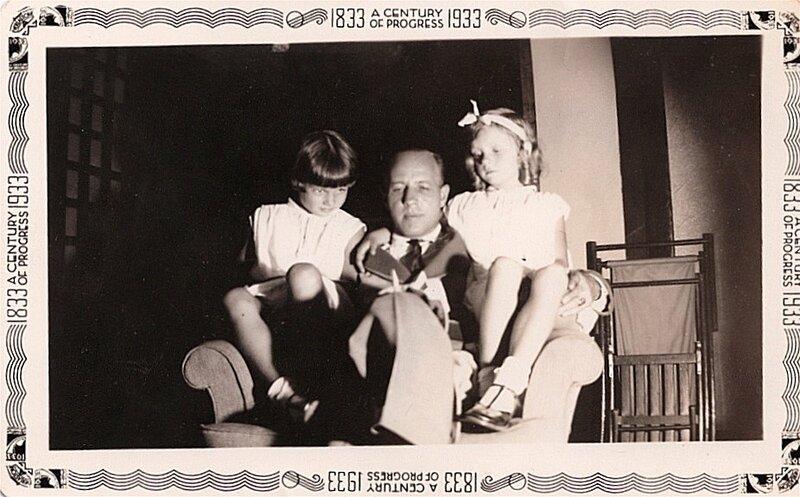 With them were Beverly and June, daughters of Mr. Burroughs by a previous marriage. 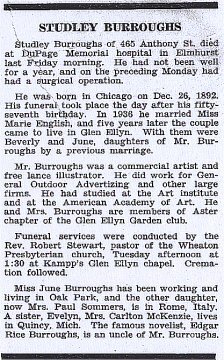 Mr. Burroughs was a commercial artist and free lance illustrator. He did work for General Outdoor Advertizing and other large firms. He had studied at the Art Institute and at the American Academy of Art. He and Mrs. Burroughs are members of Aster chapter of the Glen Ellyn Garden club. Funeral services were conducted by the Rev. Robert Stewart, pastor of the Wheaton Presbyterian church, Tuesday afternoon at 1:30 at Kampp's Glen Ellyn chapel. Cremation followed. Miss June Burroughs has been working and living in Oak Park and the other daughter, now Mrs. Paul Sommers, is in Rome, Italy. A sister, Evelyn, Mrs. Carlton McKenzie, lives in Quincy, Mich. 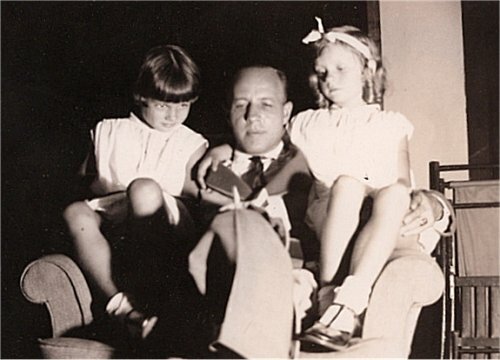 The famous novelist, Edgar Rice Burroughs, is an uncle of Mr. Burroughs. By Tony Weitzel Other day we printed a silly blurb about artist named Leonard Linn. 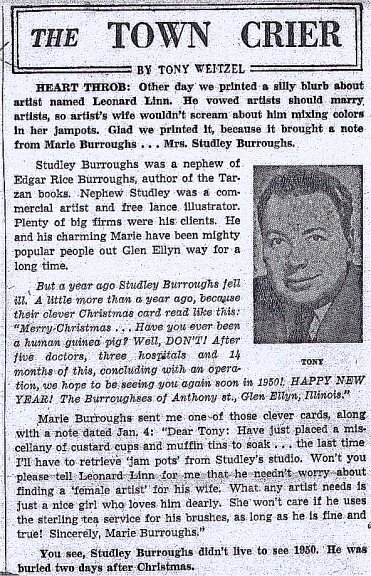 He vowed artists should marry artists, so artist's wife wouldn't scream about him mixing colors in her jampots. 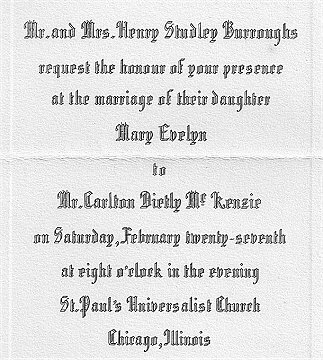 Glad we printed it because it brought a note from Marie Burroughs . . . Mrs. Studley Burroughs. 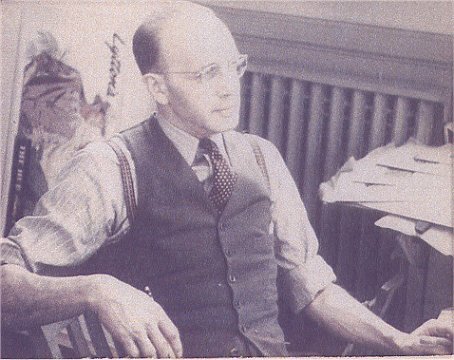 Studley Burroughs was a nephew of Edgar Rice Burroughs, author of the Tarzan books. Nephew Studley was a commercial artist and free lance illustrator. Plenty of big firms were his clients. He and his charming Marie have been mighty popular people out Glen Ellyn way for a long time. "Merry Christmas . . . Have you ever been a human guinea pig? Well, DON'T! After five doctors, three hospitals and 14 months of this, concluding with an operation, we hope to be seeing you again soon in 1950! HAPPY NEW YEAR! The Burroughses of Anthony st., Glen Ellyn, Illinois." Marie Burroughs sent me one of those clever cards, along with a note dated Jan. 4: "Dear Tony: Have just placed a miscellany of custard cups and muffin tins to soak . . . the last time I'll have to retrieve 'jam pots' from Studley's studio. won't you please tell Leonard Linn for me that he needn't worry about finding a 'female artist' for his wife. What any artist needs is just a nice girl who loves him dearly. she won't care if he uses the sterling tea service for his brushes, as long as he is fine and true! Sincerely, Marie Burroughs." You see, Studley Burroughs didn't live to see 1950. He was buried two days after Christmas.